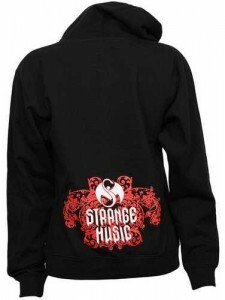 Ladies, let everyone know which Kansas City rapper holds your heart with this black butterfly Tech N9ne zip hoodie. Available in sizes M, L, and XL, this cotton/poly blend hooded sweatshirt features a red and white butterfly design and Tech’s name across the chest. The view is just as good walking away: the lower back of the sweatshirt showcases the Strange Music snake and bat logo in white atop an intricate, swirling red design. 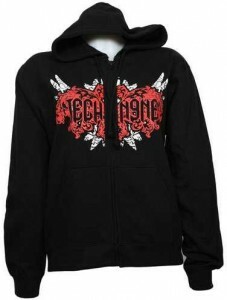 Click here to purchase one for yourself or that special lady in your life.